I am just advising of the passing of my father Arthur Rizzo who was an Australian Racing Driver in the 40's and 50's. Dad passed away peacefully at the wonderful age of 91 on 14th July 2009. Apart from being a terrific dad, he had many achievements throughout his lifetime. He won Bathurst in 1949 in his Rizzo Riley he had built himself. 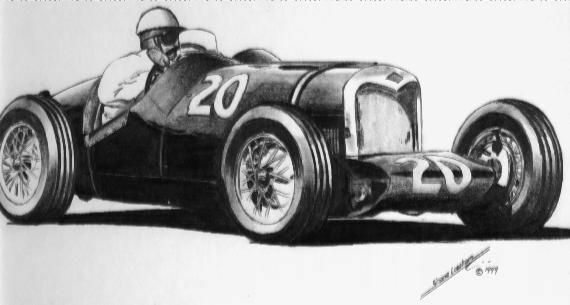 He came 3rd in the Australian Grand Prix 1949 held in Leyburn, again in his Rizzo Riley. He had numerous records held in his Riley at various Hill Climbs. He was the 1st person in the world to convert a 300sl Gullwing Mercedes Benz from Left to right Hand drive. He was extremely pleased to hear of Mark Webbers Australian win in the Formula 1 and gave a nod and a smile when he was told. Edited by RizzoRiley, 17 July 2009 - 10:14. You don't mention so much, but I'm sure more will come out as this thread develops. His mechanical skills were legendary, so much so that he was sought after by the well-to-do of Sydney's racing fraternity in the thirties and forties to overcome their mechanical ailments. And into his eighties he was happy to write about his adventures in racing... I have an article he penned here somewhere, I'll post it when I find it. My commiserations to you, I lost my father seven months ago, it creates a void in your life. Edited by Ray Bell, 17 July 2009 - 11:57. I have many articles written both by and about my Father and his contribution to Motor Sport. Over the past 5 or so years I have been recording my conversations with him (quite a few hours worth) about his Racing career and his memories of such. I hope to one day transcribe some of this as it is very interesting and entertaining. I am sure I will find it comforting to hear him still 'tell' me his stories....once he started there was no stopping him. Only a few years back I was able to obtain footage of the 1949 AGP which had footage of him racing. I put it on the TV and sat with him to watch. He said nothing and I was a bit disappointed that he made no big fuss as I had been so excited to see it with him. A few days later he said...'Love, I think I am still in shock, in all the years of racing I only ever saw photos of myself racing. It was the most unusual feeling to have actually watched myself racing the other day, I felt like I was there again. " He obviously was still processing what he had seen. I have a great photo of him watching himself race that I will treasure. My condolences to you and the Rizzo family on the passing of your father, Arthur. It's pleasing to read that your efforts in obtaining the footage of the 1949 AGP, paid off a few days after you both viewed it. My programme for this event has him as the winner in event 2 - Formula 'B' Scratch Race and 3rd in event 4 - the AGP. I'm sure that any of your father's stories you wish to share with members of TNF will be thoroughly enjoyed. Kiara, is that the very brief colour 8mm footage I sourced from a man in Brisbane? It largely shows the cars lined up, the start of the race (in which the Caddy V8 of the Regal pushes it to the front for a short time!) and not much else other than Frank Kleinig's pit stop. If it's another, I'd be very pleased to see that and trade copies with you. It has footage that runs approx 20mins covering 1949 AGP at Leyburn, clearly shows Dad leading off at the start, with a bit of the scratch race also. Has dad doing about 4 laps passing the person filming and shows numerous other cars running round track. The person filming takes a wander through the pit area giving close ups on cars being prepered. Footage also has 1954 AGP from Southport and couple of other Qld races of the era. Possibly this is the same as you already have? I have had a few people ask to write of some of dad's achievements..here is some information. This article was written by dad some years back. MY FIRST CONTACT with the motor trade was in the mid-1920s at the age of ten. Maroubra Speedway had just been built and we used to catch a tram on weekends to watch the likes of Phil Garlick, Hope Bartlett, Charlie East and many others circle the concrete saucer at speeds of 100mph - on a circuit originally designed for a top speed of 90mph. My first job in the motor trade was with Armstrong Siddeley Motors from 1932 until they closed down in 1938. While there we became very familiar with the pre-selector gearbox, and during this time we had a call from a Mr Reg Light and Rex Marshall, his mechanic. They wanted to know whether we would assemble a gearbox out of an MG K3 which they had dismantled and couldn’t reassemble. Much to their surprise, we delivered it back the same day, completed and tested. 1938 saw us at Canberra to watch the attempts on the Australian records. Peter Whitehead’s ERA sounded terrific and was hand timed at around 150mph (the timing gear refused to record his time) and Frank Kleinig removed all the gears from his gearbox prior to attacking the flying quarter mile. Later the same year we saw the ERA at Bathurst on a circuit that was all dirt. We were at the top of Conrod looking up to the Esses, and I remember the ERA coming down into Forrest Elbow in the deep wheel tracks, the fixed crank handle digging in to the mound between the tyre tracks and making a noise like a machine gun. Towards the end of the war, about 1944, I started work with Rex Marshall of Monza Service in the same building where I had started my apprenticeship. Up until that time I’d owned a Singer Le Mans 4-cyl, Le Mans 6-cyl, several Riley tourers including an Imp and a 1.5 Sprite roadster, which was an Imp type body. In 1945 we began building a monoposto MG for Alf Najar, and at the same time I started on a Riley Special for myself. John Snow had a Riley 1.5 in which the auto clutch had blown up and smashed the alloy bellhousing, so he fitted a Ford V8 and offered me the redundant engine and box for 150 pounds. After I paid for it he told me that no bellhousing was available in England - his wife had been Lord Nuffield’s secretary and had made enquiries, but to no avail. My wages at the time were seven pounds a week, which didn’t leave much to waste, and I was newly married. I wrote to Nuffield in England and enquired re a new or second hand bellhousing, only to be told there were indeed none available, and the pattern store in Coventry had received a direct hit during the war and the patterns not damaged had been burned out. I contacted a pattern maker in Sydney and borrowed a sample for him to work from, and I’d just collected it and paid 30 pounds when I received a cable saying they’d located one in England. They wanted me to confirm my order and send five pounds to cover costs and freight. It gave me great pleasure to show Mr Snow the assembled unit! My next job was to get a chassis. I bought a Riley Nine tourer with a blown engine and dismantled anything of use, dumped the body and chassis, which was of no use to me, and started looking around. At that time the wrecking yards had many old vintage cars, and I eventually settled on an early Austin 12 for the front end and a Standard rear section. The front was turned upside down and bolted and welded to the Standard rear end. For a fuel tank I brazed two cad plated four gallon drums end to end. I had decided on a 2-seater, as I intended to use it as a road car. Over the next year or so I competed with the bodywork in various stages of completion due to lack of money. The whole car was built on a shoestring, the cheapest way possible, but nothing ever broke or let me down. Even the speedo and rev counter were originally Chrysler speedos, and I made little gearboxes running Meccano gears for each of them to get the ratios right, and I had the numerals repainted. The Riley Nine rear axle was used, as were its front and rear brakes, and the front axle was a Bullnose Morris turned upside down and with the kingpin eyes reversed, which gave the car a wheelbase and track the same as the P3 Alfa which we had stored in the garage through the war years. I was approached by Peter Lloyd in 1948 advising me that he was starting up a company in his own name, and they were handling Wolseley and Riley cars. Would I be interested in joining the firm as Service Manager (subject to Rex Marshall’s blessing)? On bringing this up with Rex at lunch time, he said to grab it. Had it been offered to him he “. . would have accepted it and kicked us out,” he said, and added: “If it doesn’t work out your job will still be waiting for you.” A good bloke. I drove down to Victoria in 1949 to compete at Rob Roy’s Hillclimb Championship, practised on Saturday and almost beat the 1.5-litre record. We went back to Lex Davison’s property, where we were staying for the weekend, and removed the quarter inch decompression plate, changed the fuel and the carby needles, lapped the valves and on Sunday went out and lowered the record. We then refitted the decompression plate, changed the fuel and carbies again and drove home to Sydney. The car had been fitted with cycle-type mudguards and had been registered for some time, it being used as transport to and from work. In 1949 I decided to have another go at Bathurst, having failed the previous year with a broken fuel line. As the motor was showing signs of age, I had the block bored and the crankshaft ground, the conrods re-metalled and a spare set made ready. This was done by a club member who was breaking into the reconditioning business. I also replaced the diff unit with a 2.5 litre. The car wasn’t started until we reached Bathurst, and you can imagine my surprise to hear the bearings collapse down Conrod Straight on almost no throttle on the first practice lap. Back to Bathurst we went and dismantled the motor, pistons out the top, conrods out the bottom, and fitted the spare conrods. The following day, on the first lap of practice, the bearings went again. This time I was driving very slowly and was prepared to give it away. Jack Murray and others talked me into having a look at least, and we lifted the car up onto 4-gallon drums. I took the rods out and they were all shot. One showed signs of bright polish approximately an eighth of an inch from both ends of the white metal bearing. Examining the crank, I found that when the crank had been ground a grinding stone with the wrong radius had been used, leaving almost an eighth of the original journal surface untouched. This had the effect of concentrating the bearing load on two narrow strips of bearing, and while it was still free to turn, it effectively stopped oil from flowing out. Collapse was inevitable. A chap who was well under the weather came into the garage and I tried to explain to him that I’d had it both mechanically and mentally. He said that an engineer in the next street would remetal the bearings for me (this was Easter Sunday!) and I shooed him off. He came back a few minutes later with a micrometer to measure the shaft and took back the spare rods. I later found out he’d left a 20 pounds deposit on the micrometer! Where have that sort of people gone? Alec Hargon and his wife had the rods back late on Sunday afternoon, she remetalling, he machining, and as I had spent my time blowing out the oilways in the block and crankshaft we began to assemble. Surviving on pills to keep me awake, I had to hand fit each bearing to the uneven shaft, a lost art today, and I finally had the engine ready to start at 4:00am on race day and fell into bed for a few hours sleep. We towed the car up to the track and I drove it around the back of the pits with my goggles on, as it was dusty. Suddenly I got a call that the under 2-litre 6-lap race was ready to start, I pulled my crash hat on and just made the starting line. On lap four, comfortably in front, I undid my crash hat to get my goggles over the back of my helmet, as it had been pulling my goggles down my face. As I dropped down the Esses my hat blew off and rolled into the bush. I was blackflagged into the pits and Maclac ran out with his hat, about four sizes too small, and off I went holding it on with my hand. On the way up the mountain I got hold of the side flaps and gave it a good pull, only to find that my rubber goggles were caught under the front of the hat and stuck out from my face like a visor. I passed Harry Mann, who had gone by while I was in the pits, and won. These days you couldn’t have a pit stop in a 6-lap race and still win. Up until now it hadn’t been my weekend, and someone had to stand above me and yank hard on the crash hat to get it off - together with most of the skin off my forehead. The all-powers race in the afternoon was an anti-climax. The car ran like a clock and won easily. I was so tired that I packed up and went back to Sydney directly the race finished, not waiting for the presentation. My firm naturally got quite a shock, and after expensive advertising asked whether I could build a better car, as they would meet the cost of parts. I sold the first car to Stan Mossetter of Toowoomba, who raced it for some time with some success. I started on a tubular chassis made up of 3” chrome moly tubing fitted into an MG TD crossmember and and held together by 3” crossmembers which were machined to fit the main rails. A standard TC rear axle fitted with a 3.7:1 crownwheel and pinion (a very close fit) was used, the braking surfaces were machined off and cast iron drums from a Wolseley 4/50 fitted. The front assembly took a lot of time to figure out. The brake drums we made up with an alloy plate and a cast iron braking surface, each having to be machined and rivetted together. The brakes were 12” twin leading shoe, 10” conventional at the rear, and during a practice run at Orange we found the front wheels could be locked at 136mph without much trouble. The rest of the car was pretty straightforward. I had fitted a Wade supercharger, and on their advice regarding power to drive it contacted Fenner Belts in England. They suggested three ‘A’ section wire-cored belts, so I machined up a 4” crankshaft pulley and a 5” blower pulley, and these could be interchanged when I wanted to surprise someone. Three belts proved useless, and I never finished a race without losing all three belts. I then made up a new set of pulleys to take the heavier ‘B’ section belt and had no more trouble. The firm was having a rough time and decided to sell the car. I left shortly afterwards. Alec Mildren raced it at Orange and I have movie of Brabham leading him by a few inches, and on the third lap the Riley was in front of the Cooper Bristol. Alec had an oil cooler fitted in front of the crossmember, and while driving around in the pits at Southport in 1954 punctured the cooler and ran the bearings. He sold the car as was to Stan Mossetter, who had sold the first car. At this time I had my own garage and made about a dozen chassis for various people, one going to New Zealand. These had either a TD or a Holden front crossmember. The fibreglass Buchanan body sat too high on an MG chassis, but my low tubular chassis was ideal for them. My chassis were fitted to some well known Racing cars...notably the Gladiator and the Crowfoot Holden. I also changed a few cars over from LH to RH drive, most notable of these being a Mercedes Benz 300SL Gullwing, the first one in the World to be converted. I was waiting for a steering part and received a visit from a factory engineer (whom I had previously met) and he asked me how I had done certain jobs (all difficult), and after many diagrams in chalk on the floor he asked how I was going to do the interior of the car. At the time he was sitting on the door sill, and - much to his embarrassment - I pointed out that the car was finished. He lost no time in giving me the part I needed and left. I firmly believe that, because he spent half his time in Europe and the other half in England and Australia, he was confused between left and right. I converted several other 300SL roadsters over the years. At the end of 1966 I gave my business to the staff and retired to live on the Gold Coast. My father remained humble despite his many achievements and was still offering mechanical advice right up to a few weeks before he passed away, aged 91. Even of late, he still had a keen interest in Formula 1. He always knew who was on pole and even the qualifying times. A smile was brought to dad's face the day before he died. Eyes closed, but listening, he was told that the Australian, Mark Webber had won the Formula 1 on the preceding evening, his eyes opened briefly, he raised his eyebrows and gave a beaming smile at the knowledge of the win. my condolences, but what a great life and a great story! it's good to know that MW's victory gave him such a thrill. A fantastic personal insight from your dad. Thank you for posting it on TNF. Thanks very much for posting that, what a wonderful story, I think Mark Webber should be made aware of how his victory was appreciated by your Father. Kiara, a great story about a great man, they really did well to do what they did on their shoestring budgets in the early days. I met him in 2002 at Leyburn Sprints where he was in company with the late John Crouch. I am proud that I am the owner of one of his special chassis fitted to the Gladiator as mentioned in his story. One of my interviews I recorded was with dad was him talking about the way he built the chassis, which I then wrote and sent for a great article on the Gladiator in the magazine Vintage Racecar, July 2008. When I obtained a copy, I had him autograph the article. He was again humbled at the thought that people were still interested to hear of how he had made things all those years ago, but he retold it as if he had only made it recently, his mind was always sharp and his memory for the past was amazing. Thank you for sharing the story, Kiara. My sincere condolences on Arthur's passing - I always found him to be a genuine and helpful man, especially to a spotty-faced young fella like me. I had the pleasure of meeting him many a time since I worked in the industry only a few hundred metres from his workshop and often had the task of taking a particular problem to him and endeavouring to explain it. He was always patient and attentive to a slightly awed young man. It was one of the articles we did on Specials, I'd asked Arthur to give us some detail and what I received in the mail was just wonderful... though written by an obviously very old hand. I seem to recall I had a bit of difficulty... as you do... deciphering some of the words, but I was truly grateful for the detail he gave us. It was one of the better articles, I have to say that, and a testimony to his patience in writing all that out as well. And of so much interest here that I actually posted it way back in February, 2001. But its proper place is in this thread. I just discovered this thread while searching for history of a mercedes I am restoring. This particular car was serviced at Arthur's shop in Sydney from the 1950's until 1978 when it was abandoned in Tenterfeild and resurrected last year. it has covered 220,000 mils in it's life,a testament to both Arthur's servicing and Mercedes Quality. The Arthur Rizzo connection goes a little further with me,as my Neighbor Restored the gullwing that had been converted . Although not back to the color that Jumbo Goddard had it( Black) but to a creme colour with the chassis converted back to left hand drive. Not only that ,but my neighbor also owned one the 300SL's that Arthur converted ,for the indonesian embassy. It's now for sale just up the street from the very place it was converted almost 60 years ago. I hope a book is written about Arthurs exploits as his life represents a slice of Australian History in general,not just motor racing. Rather nice obit re Arthur in today's Sydney Morning Herald, written by a journo with significant input from the Rizzo family. I am glad to see that there would be interest in a book on my father. I have toyed on the idea over the years (hence recording my conversations with him). I have a lot of unpublished photos of his racing and the era of cars around the 40's / 50's. I wil give it more serious consideration. I hope that your restoration goes well. Kiara,this is the car your dad converted and as it looks today and owned by Vern Shuppan. [quote name='Ron B.' post='3790472' date='Aug 10 2009, 10:47']Kiara,this is the car your dad converted and as it looks today and owned by Vern Shuppan. Looks great....there is word that next years Leyburn, Qld weekend (2010) they will try to do a tribute to my fathers contribution to motoring and arrange for as many cars to be there that he has either built or been involved in their construction. Edited by RizzoRiley, 11 August 2009 - 06:28.